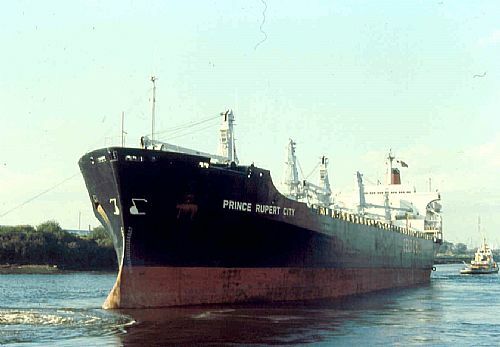 The Prince Rupert City was built by Fairfirld Shipbuilding and Engineering Co, and was the second of the seven 840 class vessels built for Reardon Smith. After nearly 40 years the vessel is still trading and the other six have been scrapped. According to Lloyds lastest Information updated 25th June 2010 vVessel still in Service. 1970 Delivered to Reardon Smith on 23rd March. 1982 Yacqui. Purchased by TMM. 1993 Sailed under various Chinese companies under several different names. The photo below was taken at Meadowside Granary in Glasgow just opposite from where she was built. It was about the middle of 1979. Captain: M.J.Higgins, C/O: N.R.Brown, 2/O: J.E.S.York, 3/O: G.Mapplebeck, R/O: B.R.Dunn, C/E: J.S.Dutton, 2/E: E.R.Morgan, 3/E: A.G.Hodgson, 4/E: R.Glendenning, J/E: A.W.Warburton, J/E: G.A.Weir, Elec: T.Willoughby, C/S: R.G.Moylan, Nav Cadets: J.A.Challacombe , P.C.Coles, K.J.Cribbin, Engineer Cadet: C.E.Hayles.